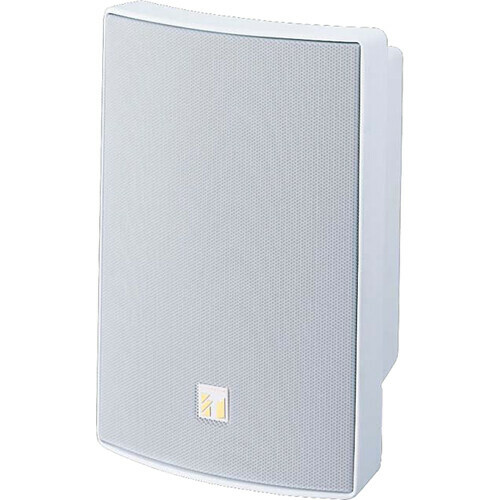 The BS-1030W from TOA Electronics is a high-quality, compact surface-mount loudspeaker ideal for background music and paging applications in schools, hospitals, restaurants, offices, and other similar venues. The durable ABS resin enclosure and steel grille allow you to use the speaker indoors or outdoors without worry. A 5" woofer and a 1" dome tweeter provide excellent sound quality with a wide frequency response. The built-in 70.7/100V transformer with screwdriver-adjustable power taps, plus the ability to bypass the transformer for 8 Ohm operation allows the speaker to work with a variety of sound systems. It can be mounted horizontally or vertically on the included mounting bracket. Ideal for background music and paging this compact speaker is perfect for schools, restaurants, hospitals, offices, and more. The 5" woofer and 1" tweeter provide a wide frequency response for great audio quality. The paintable ABS resin enclosure and steel mesh grille let you use the speaker indoors or outdoors. The built-in 70.7/100V transformer, and the ability to bypass the transformer completely allows the speaker to be integrated into an existing speaker system. The included bracket lets you mount the speaker horizontally or vertically. Box Dimensions (LxWxH) 14.1 x 11.1 x 7.9"